Rich and Kathy Barnhart (pictured), formerly of the Grace College faculty and Winona Lake (IN) Grace Brethren Church, moved to Marion, Indiana, this year, when Rich joined the faculty of Indiana Wesleyan University. Known for their public Christmas lights display, the Barnharts have started it up again in Marion. This is an excerpt from the Marion Chronicle-Tribune. To read the entire article, click here. A musical Christmas tree is Rich and Kathy Barnhart’s way of sharing the Christmas season — and their faith — with the community. This is the first year that Grant County has the opportunity to see the musical, lighted program at the Barnhart’s home, 2757 W. Ninth St.
Its history goes back to 1987 when Rich Barnhart was working in the computer science department at Liberty University in Lynchburg, Va., and the couple was attending the Thomas Road Baptist Church. “The church had a living Christmas tree in which the choir members actually stand on risers, and then they threw a switch. It was actually state of the art at the time and quite impressive,” Kathy said. But Rich Barnhart and others were looking for a new idea. Hearing about a display in Buffalo, N.Y., they traveled there. The timing was good because while teaching computer science at Liberty, he was also working on his master’s degree at Virginia Tech. In one of his master’s programs, Barnhart built a controller for lights and then the electronics department at the university worked to time it to music. The Musical Christmas Tree was born. “It was at the church in Lynchburg and, at the time, was the only tree in the country where you could control the lights in time with the music,” Kathy said. The tree become a home display after the Barnharts moved to Washington state in 1995. 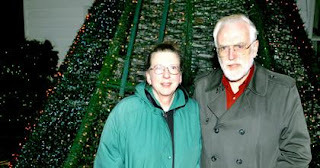 Their first Musical Christmas Tree was 12 feet tall and was made from the old timbers on their patio back in Washington State. “It was primitive, but it worked,” Kathy said. When the couple moved to Grace College at Winona Lake, the tree improved. When Grace College closed its computer science department, Rich Barnhart ended up on the faculty at Indiana Wesleyan University and the couple moved here in May.